Is your IT team spending too much of its valuable time managing your print assets, troubleshooting print issues, and supporting users? Managing a print fleet requires striking a balance between the needs of users, the ability to manage costs, and the time it takes an IT department to support and manage office printing. Being able to monitor and manage the financial aspects of device usage, and automatically collect and then analyze meter captures, allows actionable insights. Moreover, a centralized point of control for all devices across a fleet and automated task management can help lessen the workload associated with maintaining a print fleet. User interfaces for imageRUNNER ADVANCE devices and print drivers can be customized and deployed remotely. 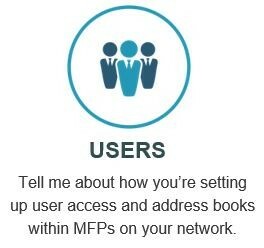 Rules such as forced duplexing or restricting color print access can be managed based on user profiles. As employees are added or removed, you can update the users and roles from one central location. Device Management Solutions from Canon can provide an organization with the ability to remotely manage and configure networked devices in order to help comply with corporate policies, support operational requirements, and maximize device functionality.